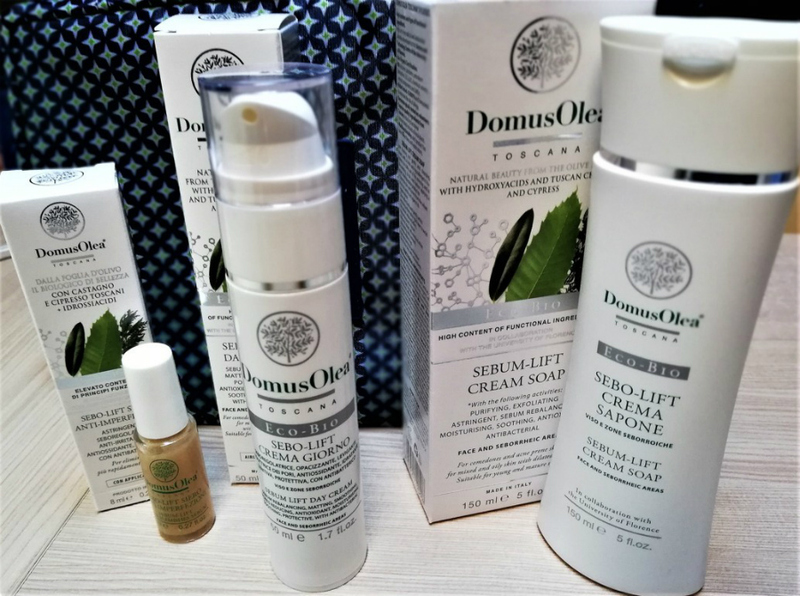 I dedicate these lines to a common problem with many skin types regardless of age: the imperfections related to an excess of sebum and impurities due to hormonal factors, alimentari, skincare inadequate ... There may be more reasons but often we tend to deal with these imperfections too aggressive solutions that lead to a worsening of the situation. 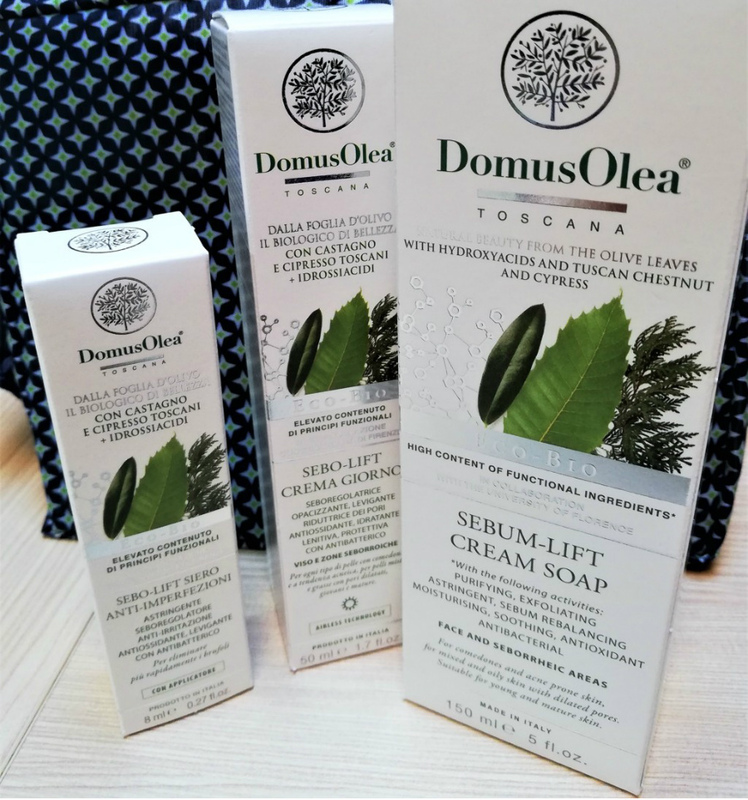 After a careful study of the cosmetic scene dedicated to this issue, I decided to try (both for me and for her teenage daughter) The Sebum-Lift line DomusOlea, Tuscan company that prefers local crops with a high content of active ingredients in formulas, studied in collaboration with the Department of Pharmaceutical Sciences of Florence. Cleansing is the first gesture of a proper routine facial, for any skin type: la Cream-Soap cleanses gently, in order to avoid the rebound effect ( or worsen the situation of attacking the skin impurities with wrong products), with the constant use constricts the dilated pores and thanks to a mix of AHA from apple, lemon, red grapes and wheat bran stimulates cell renewal. It is not meant to be a makeup remover, but it is also perfect as a second cleansing in the much renowned Korean routine. La Sebo-Lift Day Cream It keeps free the pores and prevents the formation of new impurities, keeping under control the most "bright areas" of the face; thanks to the AHA continues to stimulate cell renewal, refining skin texture and preventing the proliferation of bacteria with from the presence of azelaic. As an additional treatment, and in my opinion a small "miracle" cosmetic, SOS Anti-Imperfection It is designed for localized use and quick effect: I apply it in the evening on the reddened area of ​​a pimple coming in the morning and has already played excellently its antibacterial and soothing. Used consistently on the spots it helps in an incredible way to make them regress, thanks to its action depigmentation: everything about the azelaic acid combined Salicylic Acid, an ideal mix to defeat the impurities and maintain a healthy skin ... even at adolescence test.